It's this time of year that we begin to think up our summer travels, and which airlines to lull the hours away on those long-haul journeys. It’s the great equalizer, those 12+ hour international flights, when flying private saves you little time, not to mention money, and commercial options begin to look more appealing, especially when you consider the array of amenities that await travelers checking-in with airlines from Air France to Etihad. 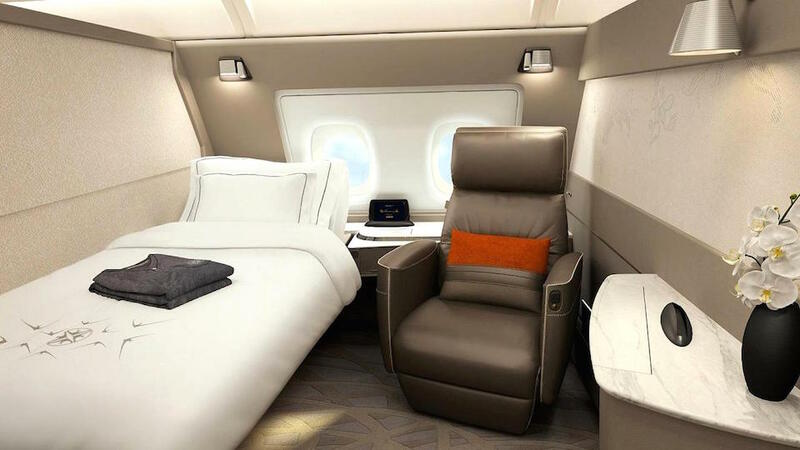 For this year, Singapore Airlines (pictured) is once more the best First Class in the sky with its new A380 First Class Suites designed by French design studio Pierrejean - more familiar with private jets and yachts than commercial airlines. What ensues sets the standard for all First Class products with separate seating and flat-bed offered in double configuration for cozy, couple time that feels more like a hotel room than an airline seat. Service is impeccable, although we still think Cathay has them beat, with free flowing Krug and Dom as well as amenities by Lalique. Swiss Airlines recently debuted a new First Class Lounge at its Zurich hub that sadly didn’t minimize the distance between the long-haul gates that are a train and long-walk away. In return, the First Class cabin on the airline's 777-fleet impresses with its design, if not comfort and configuration. Lufthansa fares far better, with its new private car transfers across the tarmac and (yes, on the tarmac) and Frankfurt's sit-down restaurant that now rivals even Paris. The flagship 747-400 features a fully separate bed outfitted in fine linens and that signature Lufthansa service that sets many of the European carriers apart from Emirates and even Etihad. But for those lucky enough to land one of its A380 Apartment Suites via Abu Dhabi, its singular, three-room suites offers fully private accommodations with near-7-ft. private bed, private vanities and conjoined beds for those lucky couples flying together and even luckier if secured using a One World award redemption. For those in Business Class, expect further consolidation in services and amenities from all airlines, including our once-favored British Airways Club World. Your experience will literally come down to where you are seated, with its 2-3-2 or 2-4-2 configuration on its 787 and A380's with middles seats sharing the narrowest of armrests you’ll ever see. And good luck getting up to go to the bathroom. American Airlines is the only US airline to stand out, with its newly configured 1-2-1 configuration on the 777-300ERs with seats that are a plentiful 26 inches wide with 17-inch in-flight entertainment screen that still allows you to converse with your seatmate without needing to ask them to get up everytime you need out.